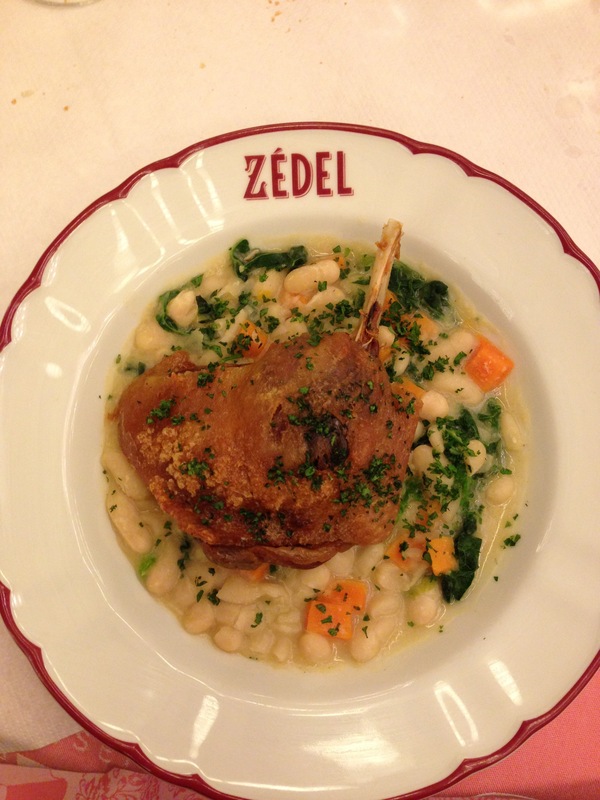 Home » ★★★★☆ » Brasserie Zédel. Democracy, on a plate. Brasserie Zédel. Democracy, on a plate. Brasserie Zédel. I’d formed an opinion about it before I went. I’d assumed I wouldn’t like it. Too big, too noisy, too everything. Listen carefully for I will say this only once: I was wrong. You can imagine my initial reaction, when an email from a Jeremy King appeared in my inbox. I don’t know a Jeremy King. I thought it was spam. I didn’t think for a second it was an actual email from the actual Jeremy King, legendary restaurateur, the one and only Mr Caprice, the man who, with his partner Chris Corbin, created such London landmarks as The Wolseley and the Ivy. But it was. So I read on. Something to do with social media and getting the name around, apparently. And a thank you to the blogging community for their support. Except I hadn’t actually blogged it, so I was a bit bemused. And I’m not a well-known blogger. But I didn’t feel it was entirely essential to mention any of that, when I accepted the invitation. And I don’t like to do PR events – I want to be able to say what I really think, without feeling obliged to be positive because I’ve been paid for. So despite my misgivings – I might not like it, but feel obliged to actually write about it nonetheless, the opportunity to meet Jeremy King was too good to miss. And listening to the silver fox himself talk about this restaurant and the idea behind it was fascinating. Affordable glamour, he said. Luxury for the masses. Based on the legendary French restaurant Chartier, even down to the logo on the plates. And I met a number of bloggers I ‘know’ by blog only. Always fascinating, the divergence between the page and the person and I’m glad I didn’t have to match the blogger with the blog. Very interesting that. Often the bolder in print, the milder in person. Like lawyers. And I was so taken with meeting all the other food obsessives and listening to Mr King talking about his restaurants, food, his upcoming holiday and his seemingly-perfect life, that I paid very little attention to the food. Shocker. So I’m not reviewing that first meal. I had to go back, to actually experience the food. And so, last week, struggling to think of somewhere last-minute for a group of five, I expected they might just be able to squeeze us in. Given that they have 220 covers and hold back a number of tables for walk-ins, your chances of getting a table without booking are fairly high. I confess that I never quite made it to this place in its former incarnation as a den of iniquity and glamour, Oliver Peyton’s legendary Atlantic Bar and Grill. You had to be somebody to get in, past the velvet rope. Or on coke. Or both. And if I had made it in, I wouldn’t have been so taken aback by the scale of this. The place is enormous. Not just a restaurant, but also a bar, a café and a nightclub. The scale of the whole operation is staggering. 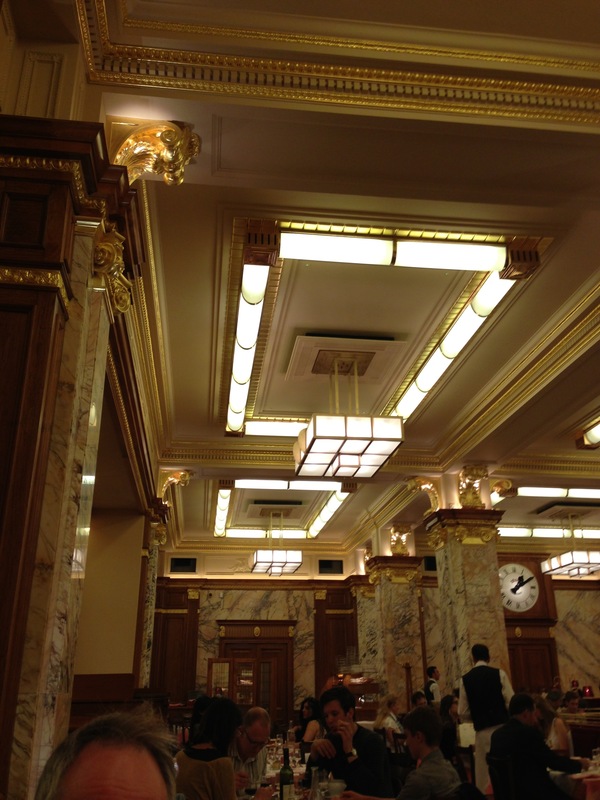 And in the restaurant, you’re hit by wall of luxe. Coral-pink marbling, gold leaf on the pillars and faux-daylight panels. Very belle époque Paris. You quickly forget that you’re in a sub-basement. If you’ve ever been to a nasty Café Rouge, banish that memory. Whilst this shares a number of dishes with that chain, it’s on another planet, culinarily speaking. This is good solid French brasserie food, very reasonably priced and served professionally, by proper waiters. And in the words of the man himself, this is affordable glamour. Based on the legendary Paris restaurant, Chartier, this is, in my view, unlike any other London restaurant in its price bracket. Good bread. Complementary. Lots of it, with decent salted butter. I managed to limit myself to two pieces. And where else can you get soup of the day for £2.95? And or goujons with tartare sauce for £11.95? 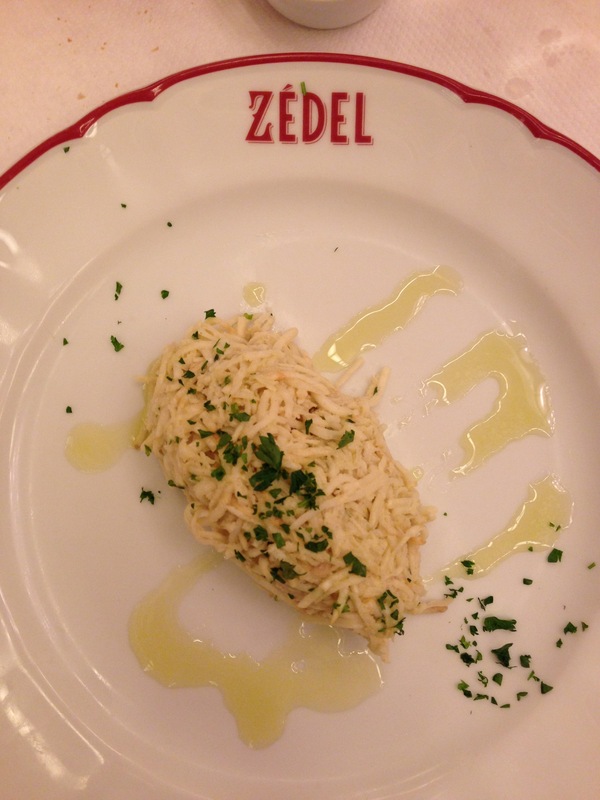 I ordered the Céleri rémoulade, which is grated celeriac with a Dijon mayonnaise. £2.95. Simple and delicious. Brilliant value. Then dish of the day: confit de canard de Gascogne,£12.95. The leg of duck was crispy and tasty, sat on a bed of cannellini beans and carrots, with parsley; this was a good and filling plateful. Not Michelin-starred cooking, but better than a lot of the food you’d find in the vicinity, with a much higher price-tag. One of my companions ordered Choucroute Alsacienne, at £12.95, a stonking plateful of porky things on a bed of sauerkraut. Another chose duck with cherries and mousseline potatoes, at a very reasonable £14.95. And I’m sorry to be banging on about the prices but I can’t quite get over what good value this is, compared to so many of the mediocre offerings, not a million miles away. This is a great place to take clients when you don’t want to break the bank but when you want to go somewhere smart and stylish. The food is pure French brasserie and accessible. The service is mostly as it should be. It’s child friendly. At night, I’d happily sit in the glamorous bar, nursing one of their classic cocktails. I might even go to the nightclub, for one of their evenings of cabaret campery. There’s something for everyone here. 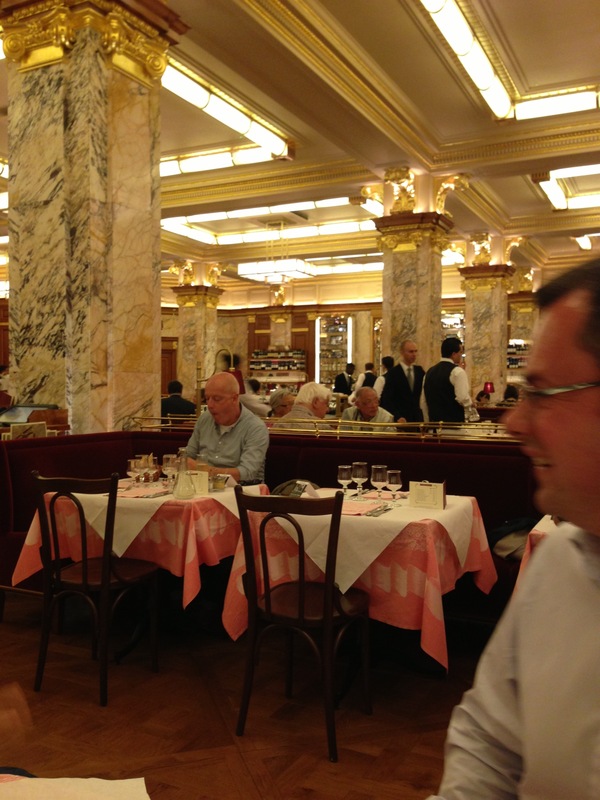 It’s the closest thing we’ve got to a big bustling classic Paris brasserie and very lucky we are too.